Château d’Arlay’s history reaches back over 1,000 years and is one of, if not THE, wineries in Europe that has remained in the same family lineage since it’s creation. It has never been sold or abandoned. Today the winery exploits 25 hectares of all south-facing vines that include Pinot Noir, Trousseau and Poulsard for the reds and Chardonnay and Savagnin for the whites. 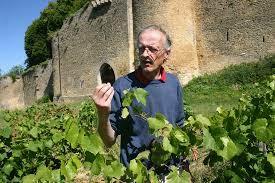 Arlay’s site is rich in Jurassic soils like Sinemurian, Blue Lias and Gray Marne. While Château d’Arlay is well known for their Vin Jaune, Vin de Paille and MacVins they are best known in the Jura as having the greatest terroir for Pinot Noir in all of the region. At Château d’Arlay it is common to say that it is Arlay being produced and not just ordinary Côtes du Jura! Count Alain de Laguiche and his wife Anne (a native of Châteauneuf-du-Pape) run the chateau and winery today and have brought the Arlay name to the greatest heights in the history of the Château!